Remittances, the money Salvadorans abroad send back to family members in El Salvador, are falling as the economic downturn in the US and elsewhere impacts immigrant workers. The chart below was prepared from data maintained by El Salvador's Central Reserve Bank which tracks remittances on a monthly basis. (click on the image for a larger version). What the chart shows is that from 2006 through 2008, each year remittances grew. But starting in August 2008, remittances are no longer higher each month than the remittance amount in the same month one year earlier. 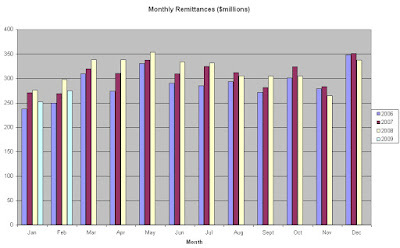 For 6 of the 7 months from August 2008 though February 2009, remittances were less than the previous year. The decline over that period is some $81.5 million from the corresponding period or a decrease of almost 4%. This 4% decline represents a significant shift from the prior pattern of steadily increasing remittances. Since remittances have been perhaps the single greatest source of money to lift families in El Salvador out of poverty, this decline is worrisome, although not unexpected. Interesting stuff. Check out this post and chart I did on March 20th that shows just how important remittances are for El Salvador. There's a real problem brewing here. we get subsidies by the govt. and we get subsidies through remittances by our family members abroad, and still we only manage to substist. until unemployment comes down to less than fifteen percent and the purchasing power of individuals starts to improve to at least be able to subsist on their own, salvadoran society and economy will remain superficial, and parasitic. This may be a blessing in disguise. There were many problems with remittances, before this decline. 1) Large portions of those cash flows feed only transient consumerism, while leaving underlying needs unaddressed. 2) There were built-in arbitrary disparities in the remittance economy. (Not everybody has generous and productive relatives abroad. 3) It let government off the hook on having to come to terms with the shortcomings of its economics. 4) It created a perverse system of legal and economic incentives which discourage productive behavior over the long term. 5) It fostered corruption. 6) It encouraged immigration, family disintegration, etc. In short, remesas were a valuable stop gap measure, but they could not be a viable long term plan. Thanks for sharing this valuable information,this is really important to us especially i am sending remittance to my family.